The new special issue of Kurdistan Review has been produced by the InvestIn Group (IIG) in partnership with the KRG’s Department of Foreign Relations (DFR). The IIG team has met with government officials and key players from the private sector to examine recent developments in the Kurdistan Region. As such Kurdistan Review focuses on diplomacy, business, energy, IT & telecom, higher education, and agriculture. Notably, “Kurdistan Review” includes exclusive interviews and analysis pieces with leading players from various sectors, who discuss the business environment in the Kurdistan Region, and their key projects that are helping to promote further growth in the Region. community for the Kurdistan Region in its fight against ISIL terrorism reflects an investment in the future of Kurdistan and its people, the publication highlights. The Kurdistan Review 2016 includes two supplements: a guide to key attractions in the Kurdistan Region, and a start-up guide for businesses seeking to establish a foothold. Kurdistan Region President Masoud Barzani and Prime Minister Nechirvan Barzani participated in a ceremony in Erbil today for the announcement of a roadmap for economic reform in the Kurdistan Region. The three-year plan under the banner of “Reforming the economy for shared prosperity and protecting the vulnerable” has been jointly prepared by the World Bank Group and the KRG, and aims to tackle key economic and fiscal challenges facing the KRG. Officials from the World Bank Group, the UN, international diplomats, and KRG and Iraqi officials also attended the event. A century ago French and British secretly reach an accord, known as the Sykes-Picot agreement, by which most of the Arab lands under the rule of the Ottoman Empire are to be divided into British and French spheres of influence with the conclusion of World War I. The Sykes-Picot agreement celebrated its centenary in May 19th, with the Middle East full of problems and divided by the war against self – proclaimed Islamic State caliphate. The Kurds have also celebrated the expiration of the agreement. In Erbil, the capital of the Kurdistan Region, a symbolic funeral crossed the downtown streets with the dream of independence, which looks coming closer and closer. “The referendum is a right of the Kurdish people to express their opinion. 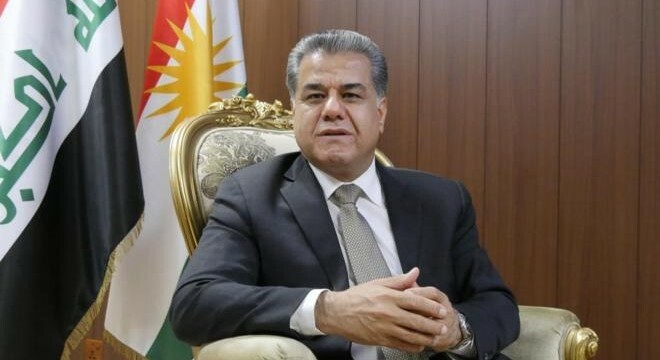 Since the establishment of Iraq, we have never been treated as equals,” said Falah Mustafa, Kurdish foreign minister, in an interview with El Mundo. Erbil, Kurdistan Region, Iraq – A Kurdistan Region delegation, headed by Kurdistan Regional Government Spokesman, Minister Safeen Dizayee, on Sunday met French President François Hollande at Elysée Palace. The two sides discussed the war against the Islamic State terrorist organization, ISIS, the financial crisis in the Kurdistan Region and the raising political tension in Iraq, along with a number of other issues. Minister Dizayee expressed his gratitude to the people and government of France for their assistance to the Kurdistan Region, noting that the Kurdistan Peshmerga Forces are fighting a war on behalf of the world against one of the most dangerous terrorist organizations. 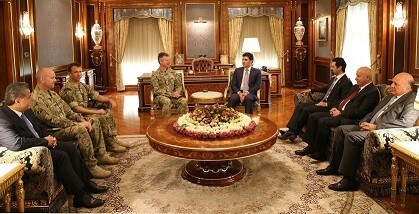 Senior Military officials of the Kurdistan Peshmerga forces also attended the meeting. Lieutenant General Sheikh Jaafar Mustafa and Major General Sirwan Barzani briefed the French President about the latest military developments on the battlefront against ISIS. The Yezidi Kurdish member of Iraqi Parliament, representing Kurdistan Region, Ms. Vian Dakhil, also attended the meeting. She stressed the importance of international community’s recognition of the atrocities committed by ISIS against Yezidis as genocide. The meeting came after the film of French philosopher and writer, Bernard-Henri Lévy, calledPeshmerga!, was selected at the Cannes Festival’s Official Selection and screened two days earlier at the festival in the presence of senior military officials of Peshmerga Forces. Both President Hollande and Minister Dizayee congratulated Mr. Lévy and his team, stressing that the film will play a key role in making the struggle and sacrifices of the Peshmerga forces known to the entire world. Erbil, Kurdistan Region, Iraq (cabinet.gov.krd) – Prime Minister Nechirvan Barzani received a senior British military delegation, headed by Lieutenant-General Tom Beckett. The visiting delegation praised the role of the Kurdistan Region military forces, the Peshmerga, in the fight against terrorism and reiterated UK’s support for the Kurdistan Region. Lieutenant-General Beckett stressed the need for closer cooperation among all parties involved in the fight against the so called Islamic State terrorist organization, particularly in the anticipated operation to liberate the city of Mosul from ISIS. 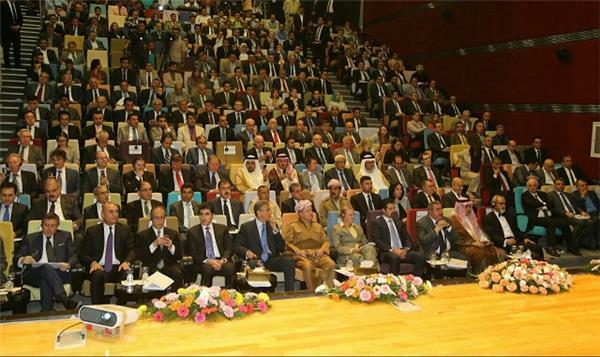 Prime Minister Barzani expressed his government’s gratitude for United Kingdom’s continuous military assistance. He said combating terrorism is a top priority of his government since terrorism is a global threat. The relations between Erbil and Baghdad, political developments in the region and post-ISIS planning were also among the topics discussed in the meeting. The meeting was also attended by Deputy Prime Minister Qubad Talabani, Kurdistan Region Presidency Chief of Staff Dr. Fuad Hussein, Minister of Interior Karim Sinjari and the head of Department of Foreign Relations Falah Mustafa. Today marks the 100th anniversary of Sykes-Picot, an agreement in which the rights of many people in the region were violated, and their will and aspirations were ignored. In particular, Kurdistan faced a historical tragedy; its people and land were partitioned. As a result, the peace-loving people of Kurdistan experienced a century of annihilation, destruction, genocide and attempts to eradicate their national identity. Today, the people of Kurdistan are in the forefront of a decisive war imposed on the free, modern and civilized world. With utmost resolve, they defend their own existence along with that of all humanity and civilization. The time has arrived for the civilized world to acknowledge the historical position that the people of Kurdistan have taken, reverse the injustice that the Sykes-Picot agreement has brought upon our oppressed and peace-loving people and respect their will and ambitions. Erbil, Kurdistan Region, Iraq (cabinet.gov.krd) – Prime Minister Nechirvan Barzani yesterday received Mr. Mahmoud Alavi, Minister of intelligence of Islamic Republic of Iran and his accompanying delegation. Mr Alavi said that Iran attaches great importance to its relations with Kurdistan Region, stressing that these relations have deep historical roots. The delegation stated that Iran has always considered the Kurdistan Region as a friendly neighbour and a factor of stability in the region. Prime Minister Barzani thanked the Islamic Republic of Iran for its support to the Kurdistan Region, expressing the Region’s readiness to work to strengthen and develop bilateral relations in various fields. The two sides exchanged views and on the current situation in the Kurdistan Region and Iraq and the war against the Islamic State terrorist organization, ISIS. Erbil, Kurdistan Region, Iraq (cabinet.gov.krd) - Kurdistan Regional Government and the Government of Hungary aim to boost bilateral ties, as the relations between the two sides have grown rapidly in recent years. In a meeting with Prime Minister Nechirvan Barzani, the Hungarian Defense Minister Istvan Simicsko reiterated his country’s support for Kurdistan Region in the fight against terrorism. He said Hungary and the international community appreciate Peshmarga’s sacrifice as they fight to protect Kurdistan Region and the entire world from the terror inflicted by ISIS terrorists. Prime Minister Barzani expressed his appreciation to the people and Government of Hungary for their continuous support in the fight against ISIS. He said, the Kurdish military force, Peshmargas, are fighting on behalf of the free world because terrorism threatens not only Kurdistan, but the entire international community. Both leaders also agreed to further develop cooperation in various sectors, including education, agriculture and trade. Erbil, Kurdistan Region, Iraq (cabinet.gov.krd) – Kurdistan Regional Government Prime Minister Nechirvan Barzani met with Italian Defense Minister Roberta Pinotti and her accompanying delegation. In a meeting, attended by senior civilian and military officials, including Deputy Prime Minister Qubad Talabani, Minister Pinotti commended Kurdish military forces and Kurdistan Regional Government for their advances in the fight against terror. Minister Pinotti also said that her country is ready to “strengthen its commitment” to the Kurdistan Region. She stressed the need for increased cooperation between the Peshmargas and coalition forces, especially the Italian troops present in the region. For his part, Prime Minister Barzani expressed his appreciation to the people and Government of Italy for their continuous support in the fight against the Islamic State terrorist organization. Prime Minister Barzani conveyed his gratitude to the Italian Prime Minister, who visited Kurdistan Region to show his solidarity when ISIS started attacking Iraqi Kurdistan. Moreover, Mr. Barzani said Kurdistan Regional Government is proud of its friendly relations with Italy and expressed his willingness to work with Italy on military, political and security issues. Erbil, Kurdistan Region, Iraq (cabinet.gov.krd) – Prime Minister Nechirvan Barzani yesterday received the new Indonesian Ambassador to Iraq, Mr. Bambang Antarikso, and his accompanying delegation. Mr. Antarikso expressed his government’s desire to strengthen relations with Kurdistan Region and establish official representation in the capital, Erbil. He said that due to its prevailing security the Kurdistan Region has attracted a large number of Indonesian workers and that his country could help with economic development, especially in the agriculture sector. Prime Minister Barzani affirmed that Iraqi Kurdistan looks toward building solid relations with all countries and that Indonesia could help develop the agriculture sector. He stressed that the doors are open to Indonesian workers and welcomed Mr. Antarikso’s suggestion to develop relations between both sides’ private sectors. Prime Minister Barzani also discussed the financial crisis in Kurdistan, outlining the Kurdistan Regional Government’s plans to address the current situation along with long-term economic reforms.